Using yards of archival footage, most shot by activists, How to Survive a Plague documents the work of ACT UP New York and their splinter group, TAG - Treatment Action Group - in their efforts to push the government to increase research into HIV treatment in the 1980s and 90s. Not just an informative and moving historical chronicle, this film uses tight editing and directing to create an exciting and compelling storyline. 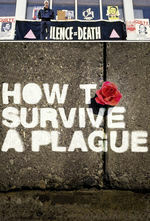 How To Survive a Plague received excellent reviews and was nominated for an Oscar. I found it a compelling argument for direct action activism and a sorrowful reminder of that time. And while the issue was AIDS and not exactly gay rights, those two issues were deeply intertwined at the time, and the film was a reminder of how much those AIDS activists did to normalize gay identity in the culture at large. It's on Netflix right now. I know watching a documentary about AIDS is not on the top of most people's Saturday night agenda, but I think it makes a really good watch from a story telling perspective. It's exciting and fairly fast-paced, it definitely brought forth tears, and it ends up quite uplifting. As an aside, I found this followup about the long tail of AIDS and how a former activists flailed in the years after HIV became a chronic, instead of necessarily deadly disease. One thing I found especially interesting about this movie, from a filmic perspective (is that a word?) is how they saved the modern footage for the end. Most documentaries employ talking heads to look back on the story and comment throughout. I liked how this movie instead followed the characters sequentially, so we have their perspective at the time, then their perspective now at the very end, as a sort of last act of the film. It gave more power to those survivor voices, and more respect to the voices of the time. I spent the movie thinking that the various talking heads at the end were all dead. It caught me totally off guard.